As we emerge from the week of Shiva for our dear friend and esteemed LH-UK president Eric Graus ז'ל, I reflect on the battles he fought for the freedom of Soviet Jewry as compared with the battles we now have to fight in the present day. This was brought home to me last week in two ways. First was my visit to the University of Nottingham for a debate on the Two State Solution (see video here and here). 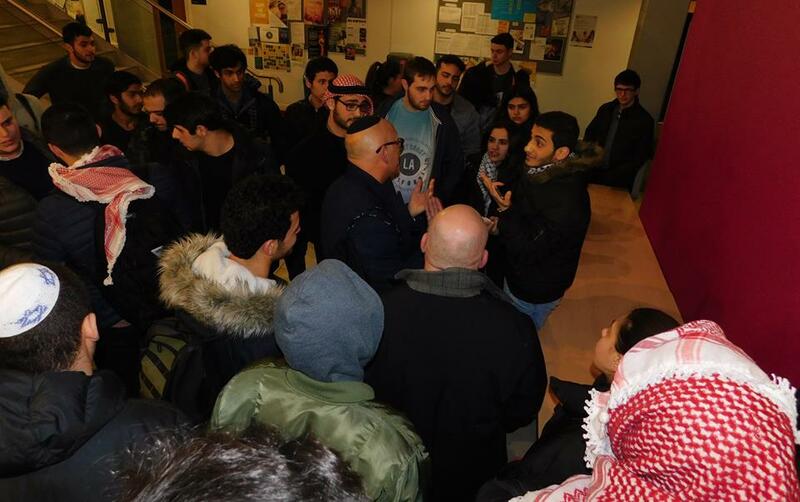 Hosted by their JSOC it was very well attended by around 100 students including around 20 members of the Jordanian Society who made a grand entrance at the last minute, some in full regalia with red keffiyehs and others sporting Arafat scarves. Still, they were good-natured both during the debate and as I was leaving, when they buttonholed me with questions ranging from refugees to white phosphorous. The significant thing for me was that my debating opponent was not one of them, but one of us. A young Jewish spokesman for the pro-Palestine group Yachad, he was a former JFS boy who became co-chairman of the Zionist Youth Movement. I shudder to think what kind of mentoring that was about. Our young Jewish warrior delivered his talking points with aplomb and total mastery of all the self-hating propaganda that is spewed out by the likes of B’tslem, Machsom Watch, Breaking the Silence and the star op-ed writers of Haaretz to eager audiences of anti-Semites all over the world. It’s almost impossible to find such erudite speakers on the Palestinian side – so here are our people stepping in to do their best. Or their worst. Why are some of our people so eager to give up our birthright? Some years ago I was visiting the Knesset – it was at the height of Iranian threats to wipe Israel off the map. There was a film crew in the atrium and, realising I was English, they asked whether I felt Iran was a threat to my existence as a Jew. I replied: “I don’t lose sleep over what is being plotted in Tehran. What does keep me awake at night is what goes on in this very building – the Knesset”. Within Israel’s crazy coalition politics and wafer-thin majorities, I have always feared the prospect of a casting vote on the surrender of parts of the homeland falling into the hands of the Arab parties. We will have committed national suicide – but we did it democratically! Cue the world for applause. In 3,000 years of Jewish history, the only forces that have ever come close to destroying us have been from within. The most famous witness to the destruction of the Second Temple, Josephus Flavius, chronicled how Jews were killing each other within, even as the Romans prepared to scale the walls from without. The IDF is more than ready to confront and defeat all external threats. But in the war of ideas it seems that our enemies are totally dependent on Jewish collaborators, who see such betrayal as a fast-track to social acceptance and personal career advancement at a time when openly supporting the Jewish state and its right to self-defence brings opprobrium and social isolation. So, from the Soviet Jewry campaigns of the 60s and 70s, we now have to focus on a new kind of Jewish refusenik – one who refuses to accept that helping the enemy has never saved our people from any threat, and it never will. Will Bibi Go For Broke ? Will our people never learn ? Will our people never learn?